Hyun Soo Kim signed with the Orioles before last season on a two-year deal. He struggled mightily in spring training and because of the nature of his contract, the major league team was forced to roster him. After just 17 plate appearances in April, he became a decent semi-regular in the lineup. The left-handed hitter got on the strong side of a platoon with Joey Rickard or Nolan Reimold being the other half. He became a decent fantasy option in daily transaction leagues by posting a .329/.410/.454 in until July 10th when he went on the DL with a hamstring injury. After the injury, he hit only .275/.353/.386. The second half numbers are decent numbers, but not as good as before the injury. 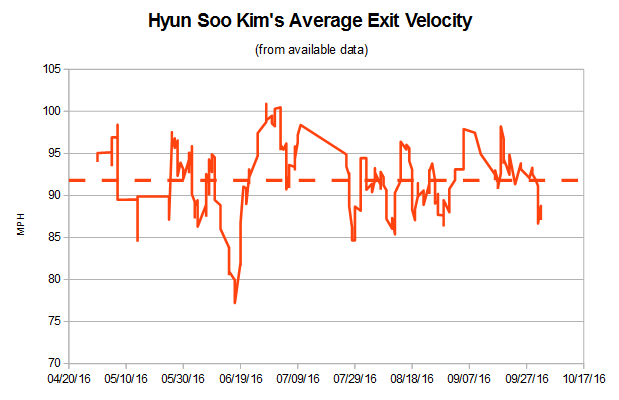 With the new StatCast data, I examined it to determine if there was a drop in Kim’s exit velocity around the time of the injury. Using a 10-day rolling average, the available data may not look like it but the rolling average generally stays around 7 mph of the overall average. Additionally, there was no huge pattern change around the time of the injury. The problem is that StatCast is not able to collect all the available data as documented at FanGraphs and The Hardball Times. The missing data is normal weak groundballs or high infield popups. I am not going to regurgitate the reasons and the exact details from the previous articles but I am going to take a step forward in accounting for the missing data. For those who don’t care about the exact details on the correction procedure, go ahead and skipped to the next paragraph. Hello to the nerds who stayed around. To fill in the missing data, I found the average value for all detected batted balls types (e.g. line drives, groundballs, etc) fielded by each position on the field. If data is missing for a play, I just inserted the average value from the known plays. The procedure I used is actually fairly simple and could be improved later. I feel though having the average exit velocity for a popup to the 2nd baseman is better than no value at all. Kim put 255 balls in play with 41 of them not having an association exit velocity. I inserted the historic average value into the missing values and here is a graph with the corrected and uncorrected data. The change is quite drastic with a 5 mph difference between the two reported values. 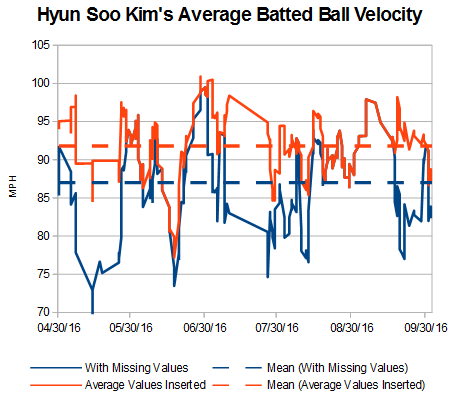 Kim really struggled coming back from the hamstring injury with the missing values bringing down his batted ball average by almost 10 mph. Here is a graph showing the batted balls with StatCast values and those which were inserted into the missing values. The difference can be seen with all the missing values being plays with average exit velocities under 80 mph. The difference with just this one player is enough for me to suspect the average velocities given for any player, pitcher or hitter (more on this later). StatCast seems fine in detecting the eye-opening power but is missing the light contact. Missing the light contact is even more important when determining if pitchers can limit hard contact since not even close to all the weak contact is being accounted for. Getting back to Kim, some of his second half struggles could be related to returning from the DL too soon. Eventually, he started making decent contact until the last half month when his production tanked. As for Kim’s 2017 projection, I am not as bullish on his power as Steamer (14 HR), speed (5 SB), and playing time (490 PA). The rest of the stats lineup in my opinion. I will go with the following projection. 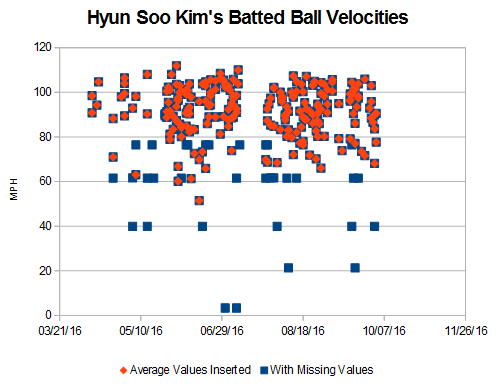 We hoped you liked reading Missing StatCast Data with Hyun Soo Kim by Jeff Zimmerman! I think that’s a pretty realistic 2017 projection for his rate stats. Having said that, don’t you think he’ll get more than 400 PA after this year? I think he will continue to be platooned so 400 sounds right.